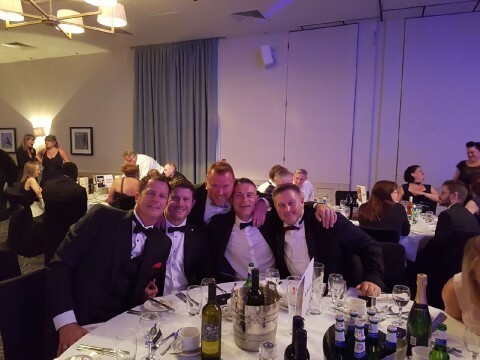 On Saturday 1 July, jhai’s Board hosted a summer ball for staff at the De Vere Staverton Estate, Daventry. Along with a drinks reception, three-course meal and disco (courtesy of RJL Events), attendees were wowed by impressive tricks from magician Steven James Magic, and treated to a performance from special guest Peter Cox of popular eighties band Go West. Peter and his band played a mixture of new tracks and familiar hits, with everyone singing along to King of Wishful Thinking from the Pretty Woman soundtrack. There was also a photo booth provided by Robert Purdie from jhai’s Swindon team. Everyone enjoyed dressing up in props including blonde wigs, Hawaiian garlands and comedy glasses, with plenty of amusing polaroids to show for it. Photos from the evening, including one of Peter Cox gamely modelling one of our pink charity hard hats, can be found on our Facebook page.